The Delano Herald Journal team was at the Final Four men’s basketball tournament. See what Sports Editor Matt Kane saw during the three games by clicking HERE. INDEPENDENCE, MN — A crash at Hennepin County Road 11 at Woodhill Drive seriously injured an Independence man at about 6:30 a.m. Friday. According to West Hennepin Public Safety Department Chief Gary Kroells, a 2004 Chevrolet Silverado driven by Jeremie Berg, 44, of Independence, was westbound on County Road 11 when it crossed the centerline and struck a 2014 Chevrolet Silverado driven by Aaron Wagner, 22, of Delano. After the initial crash, an eastbound 2010 Mazda CX driven by Lisa Krebsbach, 57, of Buffalo, was struck by Berg’s vehicle. Additionally, Jordan Renfro, 23, of Medina, had pulled his 1976 Sportster motorcycle onto the shoulder of eastbound County Road 11, as his motorcycle had run out of gas. He and his motorcycle were hit, causing minor injuries. Berg was airlifted to North Memorial Hospital with serious injuries. Wagner was transported to Ridgeview Hospital in Waconia by North Memorial Ambulance. Krebsbach was not injured, and her vehicle sustained minor damage. Minnesota State Patrol is assisting WHPSD with reconstruction of the crash, which remains under investigation. Medina Police, Minnetrista Police, the Hennepin County Sheriff’s Office Crime Lab, Loretto Fire Department, and Maple Plain Fire Department assisted at the scene. DELANO, MN – Delano City Council will consider a preliminary plat for one housing development; final plats for two other housing developments; a preliminary plat for the West Metro Business Park Second Addition; a site and building plan review and conditional use permit for KLN Foods to locate in the business park. A preliminary plat for a development named Greywood will be considered. Greywood is planned for 99 acres in southwestern Delano. A total of 239 single-family lots are planned for the development. The second housing development on the agenda is Liberty Landing, located along Wright County Road 16 between Fox Meadow and the Crow River. Plans call for the development to have 96 single-family lots. A 49-lot single-family residential subdivision named Highland Ridge Seventh Addition is the final housing development on the agenda. In response to land-area requirements of two pending business park development projects – Landscape Structures and KLN – the city has initiated a replat of the West Metro Business Park First Addition, as well as a two-lot preliminary and final plat for the second addition. The second addition will incorporate an additional 11.7 acres of land west of the first addition subdivision, which is 27.5 acres. KLN has submitted plans for the construction of a 201,000-square-foot processing and warehouse facility in the business park. The development plans call for several future expansions within the next five to 10 years, which would total 273,080 square feet, for a total of 474,080 square feet. • review a request from the public safety commission to change the name of County Road 30 Southeast to School Drive from County Road 17 to County Line Road. • review a special event permit application, submission deadlines, and related fee schedule. • review an erosion control policy and related amendments to the city’s building permit application. There was plenty of flow on the Delano roster this state tournament, and those who make the decisions for the annual hockey hair team noticed. Check out the video HERE. MINNEAPOLIS — The 2018-19 Delano teamed ended its season the same way the 2016-17 team did, clutching the Class A state consolation championship trophy for a postgame photo at Mariucci Arena. 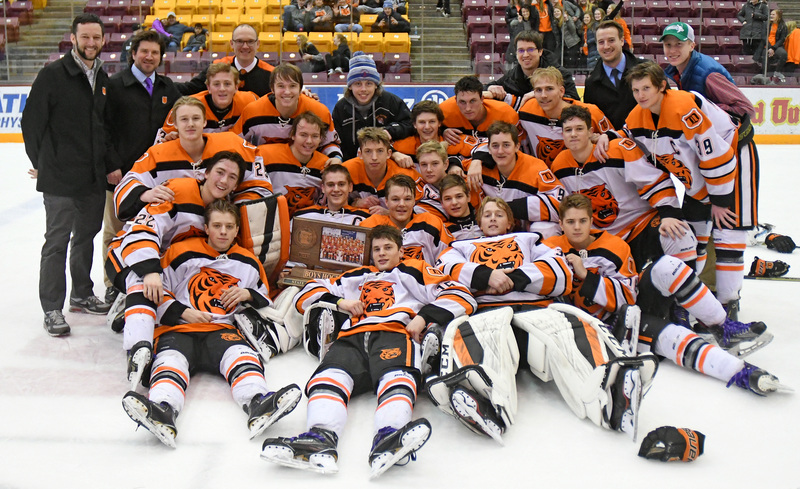 This current Delano squad claimed the hardware with a 2-1 win over North Branch before the lunch bell rang, as the Tigers and Vikings faced off at 9 a.m.
Delano poses with the Class A consolation trophy Saturday morning at Mariucci Arena following a 2-1 win over North Branch. 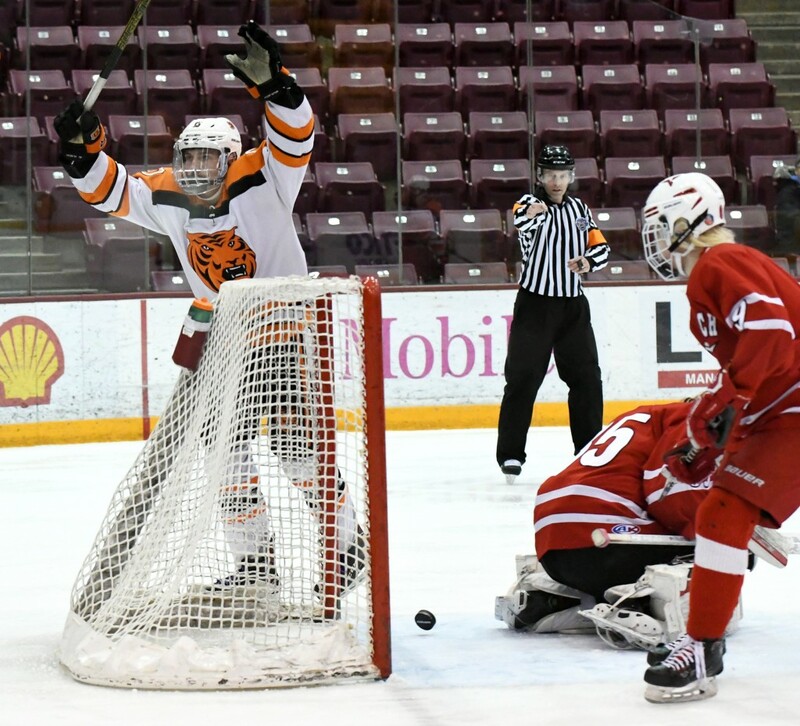 The win was not an easy one for the Tigers, as they had to kill off a five-minute major penalty over the final 4:47 of regulation to secure the one-goal lead. In the final minute of that time, Delano faced a 6-on-4 situation after the Vikings pulled goalie Jake Turek for an extra skater. Delano failed to clear the puck on several tries, but the Tigers did what they pride themselves on — blocked shots, a handful of them in that final minute. Goalie Aaron Kruse peaked his eyes around screens and through traffic, but did no feel a piece of rubber in the closing minute. Kruse made 21 saves for the game. Turek made 17 saves for North Branch. Delano led 2-0 on goals by Michael Weber and Adam Brown. North Brach made a game of it with two minutes to play in the second period, when Joey Kerchner beat Kruse cleanly. Brown figured in on both Delano goals, and finished with six points for the tournament. He set up Weber for the game’s first goal at 9:50 of the first period, and used his hustle and tenacity to poke a puck through Turek for a short-handed goal at 9:33 of the second. This short-handed goal by sophomore Adam Brown in the second period held up as the game-winner in Delano’s 2-1 win over North Branch Saturday morning at Mariucci Arena. Brown had two assists in the Tigers’ 6-4 opening-round loss to Greenway. He scored the first of his two goals in Delano’s 2-1 win over New Ulm in the consolation semifinal game Thursday. Jacob Marciniak had the second assist on Weber’s goal in Saturday morning’s game. It was the second assist in as many consolation games for Marciniak. Quinn Daly had the lone assist on Brown’s goal. Not long after Delano accepted the consolation trophy at Mariucci, St. Cloud Cathedral raised the Class A championship trophy at the Xcel Energy Center following a 5-2 win over Greenway. Mahtomedi defeated East Grand Forks 7-3 for third place.